The Juba Weaver Ploceus dichrocephalus is a poorly known weaver with a small range. The male (photo left: photographer János Oláh / Birdquest) is golden yellow with the head to nape and breast dark chestnut to blackish. The plain yellow-green back is not streaked as is the Village Weaver. The female lacks yellow underparts of the male, has a buff breast and flanks, and brown eye. The female is best separated from the similar female Vitelline Masked Weaver by a 2-tone bill being dark above and light below. 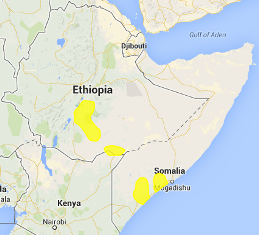 The Juba Weaver occurs in Ethiopia, Somalia and extreme NE Kenya but breeding is only known from Ethiopia (see map below, based on Birds of Africa). No races are recognised. 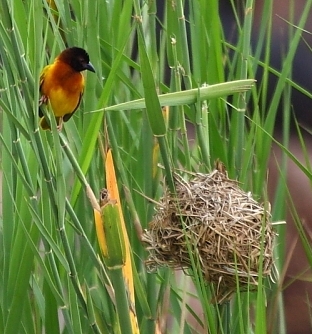 The Juba Weaver inhabits riverine bush, short grass savanna, Acacia-Commiphora thornbush, and semi-desert savanna. The Juba Weaver feeds on seeds, and probably also on insects. It is generally found in pairs and small groups. The Juba Weaver is probably polygynous. It is colonial, nesting in small groups in trees or reeds. The nest is oval, with virtually no entrance tunnel. It is woven from grass, and lined with fine grass. The nest is suspended from the tip of a branch or at side of a reed. The eggs (clutch 2) are pale greenish-blue or greyish-green, spotted with brown and lilac. Nothing else is known about breeding. There are no PHOWN records for the Juba Weaver (see PHOWN summary), and many are needed. Submit any weaver nest records to PHOWN (PHOtos of Weaver Nests) via the Virtual Museum upload site.